Record sales growth and profitability are within reach for this home improvement titan. Home Depot (NYSE:HD) trailed the market by a wide margin in 2016 as its market-thumping customer traffic growth pace fell back down to earth. Shopper visits are up 3% over the past nine months, compared to 4% gains in each of the prior two fiscal years. Shareholders have no reason to panic, though. In fact, Home Depot's future looks bright even in the context weakening customer traffic. Home Depot's sales growth sped up last quarter to a 6% pace from 5%, which kept the company well ahead of rival Lowe's (NYSE:LOW) and its 3% uptick. What's even more impressive about this acceleration is that it came despite weak customer traffic gains. Home Depot made up for this traffic shortfall by posting higher average spending, though. Transactions valued at $900 or more jumped by 11%. That's no fluke. Home Depot is expanding into the professional customer segment that, at $120 billion of annual spending, is almost as big as the consumer market that it currently dominates. As a result, pros are kicking in a disproportionate amount of growth these days. Pro sales grew faster than the company average last quarter, which led to market-beating growth in categories like industrial lighting, plywood, and fencing. Home Depot sees a long runway for future gains with this segment and it plans to cater to the big spenders through improved product offerings and perks like higher credit limits on its private-label credit card. Next-day delivery options for bulk products like concrete are also being rolled out to keep the pro shoppers loyal to the retailer. Home Depot began investing heavily in its e-commerce infrastructure years ago as management quickly realized that digital would need to be a core plank of its operating success. That proactive approach is paying off in spades right now. Online sales rose 17% last quarter to account for nearly 6% of the business. Compare that to Target, which currently gets just 3% of its revenue from the digital channel. Home Depot's success is a testament to what management calls its interconnected retailing strategy. For example, store employees have the power to order items for customers directly from the shopping aisle. And almost half of its online orders involve a trip to the physical store by the customer. The company is pushing that integration even further in 2017 when it plans to roll out the functionality to have home deliveries occur directly from local stores rather than from its network of online fulfillment centers. Sales growth isn't much good unless management can effectively use it to generate shareholder returns. Home Depot has proven itself to be among the best in the entire market on this score. Start with profitability, where operating margin just touched 14% of sales -- or almost double Lowe's result. Executives are expecting that figure to keep climbing toward 15% by fiscal 2018. 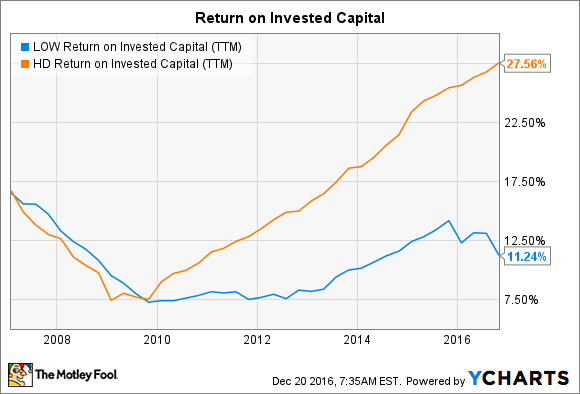 Home Depot's return on invested capital (ROIC) is rising, too. That core efficiency figure jumped to 29% over the past 12 months to notch a 4-percentage-point improvement over the prior year. Home Depot trounces Lowe's, and most other public companies, on this key metric. CEO Craig Menear and his executive team believe ROIC will hit 35% of sales by 2018, around the same time that the company breaks $100 billion in annual sales for the first time. Operating profit that year should crest a record $15 billion. Those numbers don't describe a business that's struggling to find growth, but one with a bright future ahead.